Instant Imprints Carrollton, GA | Custom T-Shirts, Embroidery, Signs and More! At Instant Imprints Carrollton, our customers come to us when they want to be more visible to their customers. We create that visibility five different ways: Branded Apparel (embroidery), Signs & Banners, Promotional Products, Custom T-Shirts and Print Services. I give this company five stars. My husband's company ordered numerous promotional products from them. He was very happy with the company. So I decided to try Instant Imprints out. I ordered T-shirts and a banner. At two different times the service was awesome they did a great job. Is your business looking to give a major boost to its brand visibility? Instant Imprints provides superior custom t-shirts, printing services, promotional products, custom banners and branded embroidery items, right here in Carrollton. We have the expertise and the latest tech to get your promotional project done right. Just ask your phone, “What’s the best print shop near me?” It’s no doubt that Instant Imprints in Carrollton will be at the top of the list! At Instant Imprints, we understand that it’s the personal attention-to-detail that our Image Experts provide that keeps customers coming back. By understanding your project goals and answering any questions you may have, our Carrollton staff works to serve you the best promotional product experience around. When you want a world-class product designed with the local care of a Carrollton expert, Instant Imprints is the print shop for you. Custom t-shirts serve as powerful ways to promote your brand, across Georgia and beyond. When you want to give your logo legs, a well-made custom tee can bring your brand image wherever your shirts may travel. You can give custom t-shirts away to attract new potential customers, or put them up for sale so that your fans can show their support. If you want an even greater level of sophistication and durability, our custom embroidery service can decorate virtually any type of garment! Georgians know how important it is to stand tall and represent yourself proudly. 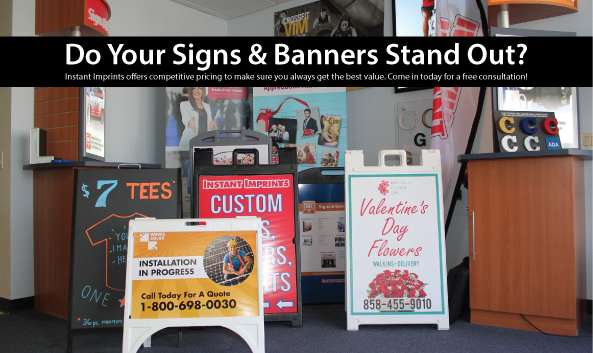 That’s why our custom signs and banner service is made to help you stand out above the competition. We help you bring your logo to the streets, with sidewalk signs and road-worthy banners. Our Image Experts are more than happy to help you find the right combination of materials, fonts and colors to make the most effective sign possible. Across Carrollton and beyond, your brand should get the visibility it deserves! When you’re ready to take a big step toward a more visible brand, stop in at our S Park Street showroom, give us a call at (770) 214-2777 or request a quote online today!